Today's Ten on Tuesday was a little bit challenging. I do not mind cold weather; in fact, I kind of enjoy it. I learned the best way to dress for extreme cold (layers, lots and lots of layers) as a kid who walked about a mile to and from school in Wisconsin winters. When I was in fourth grade, my plastic glasses frame snapped from the cold on my walk home from school. After that, I put them in my pocket and walked home a little bit blind on sub-zero days. As a gown-up, I appreciate having the option to stay inside on cold days. Carole's challenge this week is to share 10 favorite soups. Soup is one of my favorite things to make and eat; I'm not sure I can limit my list of favorites to just 10. Here's a try in no particular order. Black Bean. This is on my mind because I made a very tasty pot last night. I started here and then modified it by using red peppers instead of tomato, ground chipotle instead of jalepeno, pork stock instead of chicken broth, and cooking my own beans instead of using canned. Minestrone. I usually make a vegetarian version with parmesan rind to flavor the broth. Green split pea in any form. I love it with ham, but usually make the vegetarian version from the original Moosewood Cookbook. White bean and swiss chard. I pulled a recipe out of the Williams-Sonoma catalog at least 10 years ago and make it at least once every winter. Potato, leek, and kale from another Moosewood book, but I don't remember which one. Mom's post-Thanksgiving smoky turkey noodle. Dad always cooks the turkey on the grill (more space for side in the oven that way), and the turkey stock Mom makes the next day is a little smokey and extra tasty. Homemade cream of mushroom. I use the recipe from the original Vegetarian Epicure cookbook. Squash in any form. My sister makes hers with red lentils, curry, and coconut milk. I have that recipe stashed somewhere and all the ingredients in the house. I think I know what I'm making next weekend. Now that I've stopped at 10, I realized just how many other soups I love: New England clam chowder, Grandma's Manhattan-style fish chowder, my friend Richard's vegetarian French onion, traditional Indian dal, red lentil, egg drop, won ton, and tom yum. Let me know if you have a favorite I should try, or, let me know if you want to come over for soup and a nice slice of crusty bread. Knit with cashmere. I have cashmere blend yarn for several sweater-sized projects in the studio. This is my year to use it. 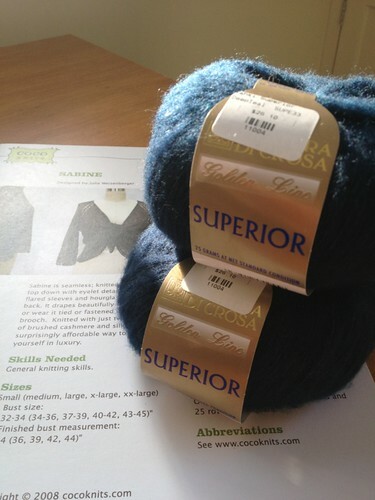 I will earn a bit of luxury knitting every time I complete a fitness goal. First up is Sabine in Superior. Run a 5K race in March or April. D and I have started running again. If we survive our cold winter morning runs, stay healthy, and stick to the plan, we will be ready for a 5K by St. Patrick's Day. Run a 10K race in September. If we keep training through the spring and summer, we will be ready to tackle a longer distance by the end of summer. Finish 12 sweaters. This is much less of a stretch than you might think. There are at least 10 nearly finished sweaters hiding on my shelves that stalled for some reason. It is time stop procrastinating, solve the problems, and finish them. Finish 12 pairs of hand knit socks and give most of them away. My sock shelf is overflowing, but socks are still my go to project for travel knitting. Since there is a lot of business travel in my future, there will be a lot of socks. Spin every day. Even 10 minutes a day with a spindle adds up to quite a bit of yarn after a few weeks. Daily efforts at the wheel lead to more consistent finished yarn. My spinning focus this year is spinning for a purpose rather than just spinning. I have made myself a personal fiber club of 6 bumps of fiber that I will spin for a specific project. Knit with handspun. If I am spinning with the end project in mind, I need to knit the project when the yarn is finished so I can evaluate my progress and figure out what to do better next time. I also need to make some space in my handspun bin for the other yarns I plan to spin this year. Learn how to weave. The more I talk to weavers and handle hand woven cloth, the more I want to weave. I am going to start looking for a used loom in May and take a weaving class or two later in the year. Go back to Hawaii with D. We have not been there since 2009. It is time for a visit. Post to this here blog at least once a week. I will start with Carole's Ten on Tuesday this month, and see where that leads me.